Mazda's CX-5 subcompact crossover was first introduced as a 2013 model. Given a minor facelift in 2016, the 2018 model marks the first major re-design of what has become the brand's best-selling vehicle. Visually stunning from any angle, the 2018 CX-5 sends every other crossover in its class – and more than a few above it – to design purgatory. Mazda explains its Kodo design language as "breathing life into the car." 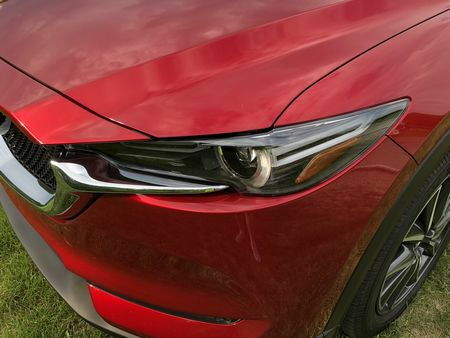 To our eyes, it represents a restrained elegance that begins up front with Mazda's signature shield-shape grille – the lower portion of which is outlined by a thin chrome ring that rises up to trace its way under the narrow headlights. The look along the sides is much simpler, with aggressive wheel arches, a deep character line just above the rocker, and a narrow chrome strip along the beltline that kicks up behind the back window. The sculpted rear fascia features a body-colored upper spoiler, a pair of narrow, horizontal tail lights, and a simple black lower valance with cutouts for a pair of round, chrome-tipped, exhaust pipes. 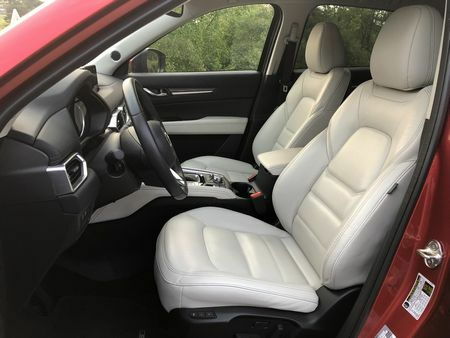 All of that goodness is wrapped around an equally stylish interior awash in rich-looking soft touch materials that – especially in Grand Touring trim – approach premium levels of luxury for thousands less. The cockpit – driver-centric like all Mazdas – offers supportive front seats and the driver’s view out the front and sides is excellent, although the A-pillars aren’t all that narrow. The view out the rear three-quarters is helped by a small window between the C- and D-pillars - although the D-pillar, itself, is fairly wide. For the most part, the controls are intuitive, well organized, and within easy reach of the driver. Durable cloth upholstery is standard, while leather-trimmed Grand Touring models approach near-BMW levels of luxury at a fraction of the cost. New for 2018, Sport models receive the same leather-wrapped steering wheel and shift knob as Touring and Grand Touring trims. The various dashboard gauges and knobs are clear and easy to read as well as intuitive. 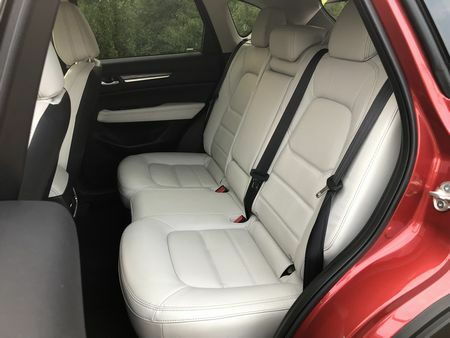 Both front seats are nicely bolstered, the cushions feel softer, offering more comfort on long trips, while Touring and Grand Touring models feature power adjustment for the driver and, even with a sunroof there's plenty of head, hip, leg and shoulder for both occupants up front. But there are shortcomings. The faux leather upholstery on the Touring model looks a little chintzy, the seats are comfortable, but three adults will find accommodations tight, while the cargo area behind the second row, at 31 cubic feet, is on the small side for the class. 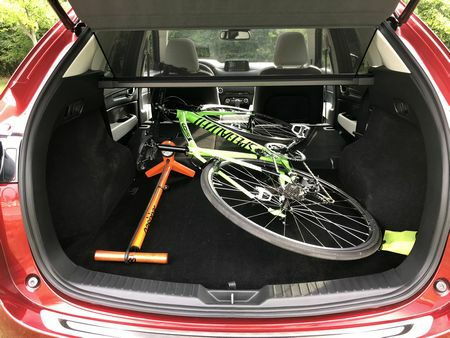 In addition, the view out back – partially blocked by the rear seat headrests - isn't helped by the smallish rear window (fortunately, a rear view camera is standard). 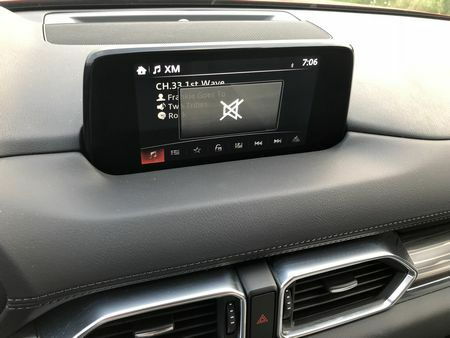 Our biggest issue, however, has to do with the CX-5's infotainment system. 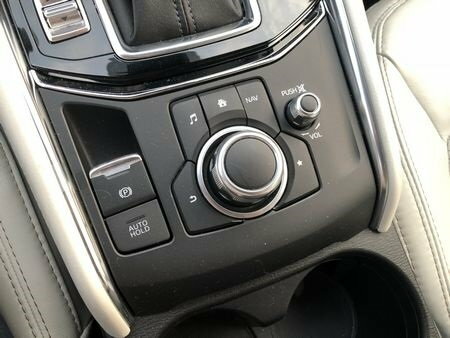 For one, the control center's placement on the center console is too close to the arm rest - requiring an awkward bend of your hand to operate. Secondly, the system of menus and sub-menus is often too distracting to operate while driving. Finally, we could mostly forgive all the messiness if Android Auto and/or Apple CarPlay were offered – but they aren't. 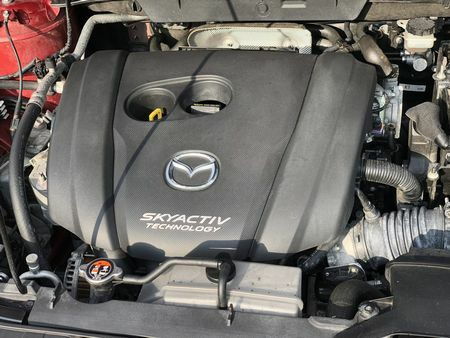 All models come with the latest version of Mazda’s Skyactiv-G 2.5-liter 4-cylinder engine that now features cylinder deactivation that, in low-load situations, allows the engine to run on just two cylinders for improved fuel economy. Horsepower is up by three - from 184 to 186, while maximum torque increases from 185 lb-ft to 186 lb-ft of torque. 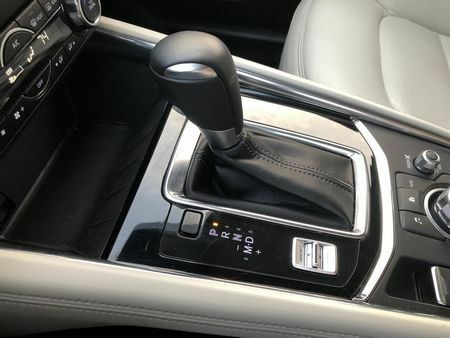 The 6-speed manual t formerly offered on entry-level FWD Sport model has been dropped for 2018, and the only transmission offered is a conventional six-speed automatic. Fuel economy is another one of the high points of the CX-5 and not something you’d expect in crossover that’s this much fun to drive. The front-wheel-drive CX-5 scores an EPA-estimated 25 miles per gallon in the city, 31 on the highway, and 28 combined, with all-wheel-drive models nearly as good with EPA-estimated 24 mpg in the city, 30 on the highway, and 326 combined. Around town, we consistently achieved 27 miles per gallon, while highway fuel economy averaged 32 miles per gallon. We believe compact crossovers don't get any more entertaining than the CX-5. The polished ride, communicative steering, and slick chassis tuning are among the best in the class. It tracks nicely down the road and suspension compliance is excellent with body lean being well controlled through the corners. The ride is firm, but not at all jittery – not an easy thing to accomplish in a vehicle with this profile. Braking is uniformly excellent, it's easy to modulate the brake pedal, and there's a good initial bite to the pads with plenty of feedback to the driver. Along with that, the nicely-weighted electric steering comes with G-Vectoring Control - an engine torque vectoring system that not only reduces the number of corrections drivers have to make entering and exiting corners, but also helps in straight-line tracking at highway speeds, making freeway driving less taxing. 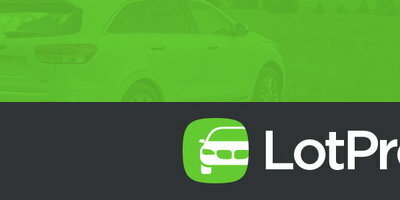 The 2.5-liter engine offers brisk off-the-line acceleration, linear throttle response, and – this year – the first US application of cylinder deactivation technology in a four-cylinder engine: under certain low-speed cruising conditions it shuts down two of four cylinders for improved fuel economy. With 150 miles behind the wheel, we struggled to notice the system working - while returning 27 miles per gallon in mixed driving. But there are drawbacks. 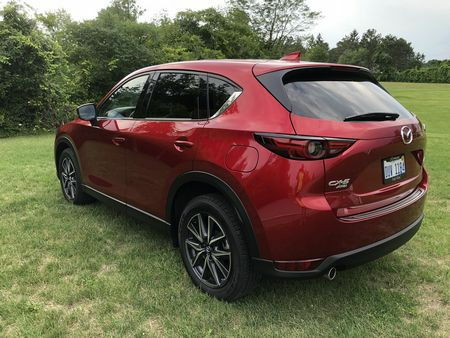 The engine sounds buzzy when you put your foot into it, and it's hard to ignore the more powerful, turbocharged offerings from competitors, and while the CX-5 is fun to drive, the larger 19-inch wheels offer a stiff ride. 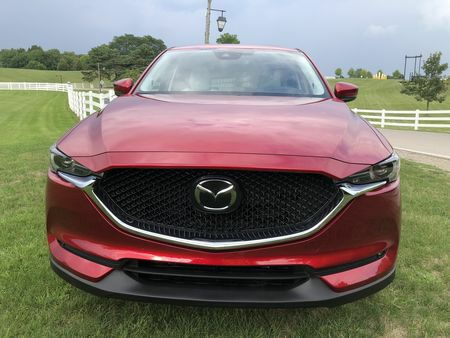 Secondly, while it's fine and works well in the background, the standard six-speed automatic feels antiquated and it's hard to fathom Mazda's decision to add fuel-saving engine technology to a drivetrain featuring a transmission with just six gears. 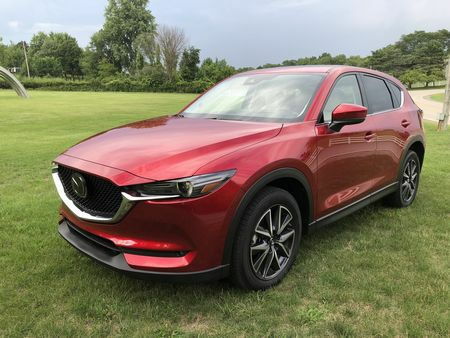 Prices for the 2018 CX-5 start at $24,150 for a front-wheel-drive Sport and run up to over $37,000 for a fully-accessorized all-wheel-drive Grand Touring equipped with the Premium Package and finished in stunning Soul Red. 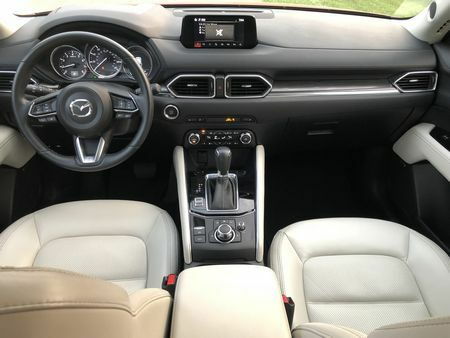 Aside from the typical power features, all CX-5s come with alloy wheels, LED headlights, keyless entry with push-button start, a leather-wrapped steering wheel and shift knob, a seven-inch touchscreen, and Bluetooth phone and audio connectivity. All models come with a rear view camera, blind spot monitoring, rear cross-traffic alert, and low-speed automatic emergency braking. 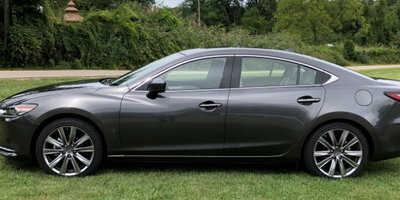 Standard on the Touring and Grand Touring versions, but a $625 option on the Sport trim adds automatic headlights, rain-sensing wipers, lane departure warning, lane keep assist, adaptive cruise control, and all-speed automatic emergency braking - a very good price for that much equipment. 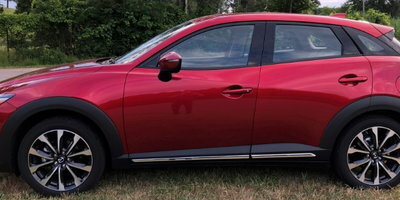 Our Soul Red Crystal Metallic Grand Touring AWD tester had a base price of $30,945. 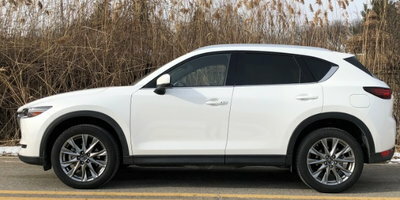 Adding $400 for illuminated door sill trim plates, $595 for the Soul Red paint job, a $125 rear bumper guard, $250 retractable cargo cover and the $1,395 Premium Package that included a head-up driving display with traffic sign recognition, heated rear seats and steering wheel, and windshield wiper de-icer brought its MSRP, including a $975 destination charge, to $34,685. 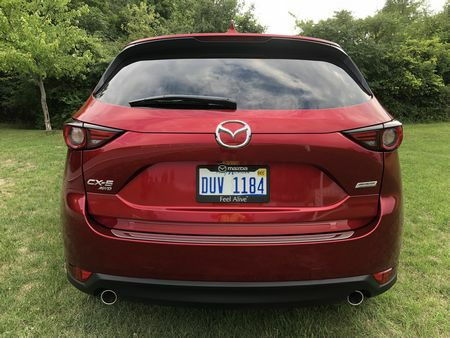 Despite a frustrating infotainment system, mediocre cargo space, and responsive handling that even we have to admit isn't for everybody, we are impressed by the CX-5's striking design, excellent fuel economy, entertaining chassis, and wide range of standard and available advanced safety features – making it our choice in the compact crossover class.